Programmer and debugger for 8-bit (STM8, ST7) and 32-bit ARM microcontrollers. Compiler / Debugger code size limitations apply. 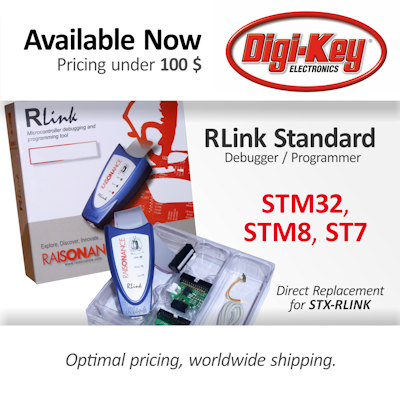 RLink Standard provides unlimited programming of a full range of microcontrollers from 8-bit to 32-bit families and real-time debugging of applications while they run on the target device. 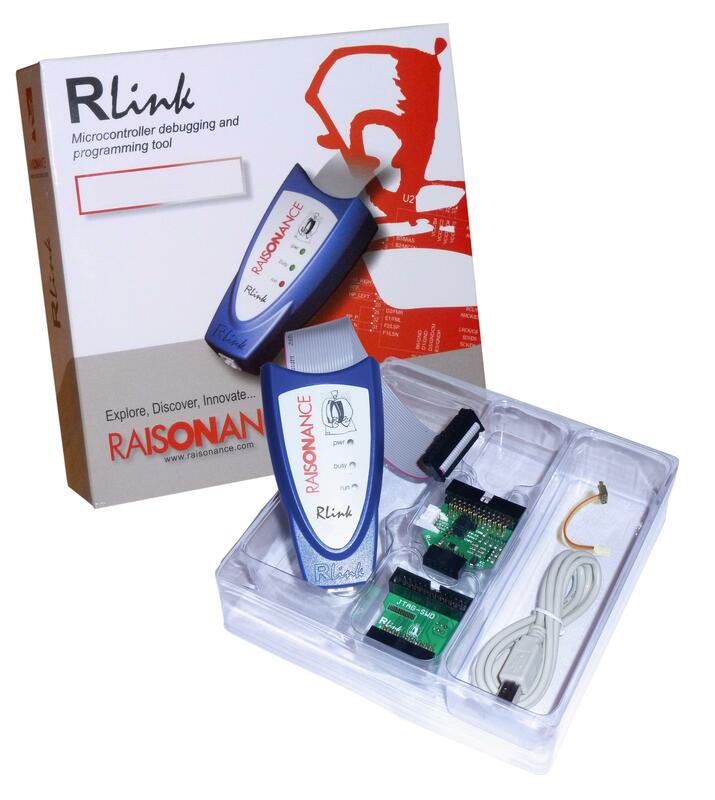 The RLink includes the RKit-ARM Lite and RKit-STM8 Basic software tool sets which include device support, C tool chain and enable debugging and programming features of Ride7 and RFlasher. It offers unlimited programming of all supported 8-bit and 32-bit devices while driven by either the free RFlasher7 programming software or the Ride7 integrated development environment. STX-RLINK is the STMicroelectronics' part number for the Raisonance RLink-STD or "Standard". The two products are technically identical, support the same range of microcontrollers and the same performance characteristics using the same software packages. For more than a decade Raisonance provided the RLink to STMicroelectronics for resale as the STX-RLINK. ST has since discontinued this resale arrangement, but we continue to support and sell the RLink to support users of STM32 and STM8 microcontrollers. In addition, the RLink also supports legacy microcontrollers that are not supprorted by other programmer/debuggers such as the ST7*, STR7 and STR9 families of devices. * Note: ST72C variants are not supported.